History Proclamation of Indonesian Independence August 17, 1945 Complete .. On August 17, 1945 is a special date for the Indonesian people, because on that date the Republic of Indonesia began to stand, the Republic of Indonesia began echoed the proclaimer of independence by Sukarno and Hatta M. Before Indonesia declared its independence on August 17, 1945, many of the events behind the occurrence of the greatest events in the history of Indonesia. For those of you who do not know about the history of the proclamation of independence of Indonesia August 17, 1945, following full review. On August 6th 1945 an atomic bomb dropped on Hiroshima, Japan by the United States have begun to demoralize the spirit of the Japanese army in the world. A day later the Committee for Preparatory Work for Indonesian Independence BPUPKI, or Dokuritsu Junbi Cosakai, renamed PPKI (Committee for Indonesian Independence) or also called Dokuritsu Junbi Inkai in Japanese, to further confirm the desire and the goal of achieving the independence of Indonesia. On August 9, 1945, the second atomic bomb dropped on Nagasaki, causing the Japanese surrendered to the United States and its allies. This moment is also used by Indonesia to declare its independence. Soekarno, Hatta as leader PPKI and Radjiman Wedyodiningrat as a former chairman of BPUPKI flown to Dalat, 250 km to the east sea Saigon, Vietnam to meet Marshal Terauchi. They reported that Japanese troops were on the verge of defeat and will give independence to Indonesia. Meanwhile in Indonesia, on August 10, 1945, Sutan Sjahrir had heard the news over the radio that Japan had surrendered to the Allies. The underground fighters preparing proclaimed Indonesia's independence, and rejected the form of independence given as a gift Japan. On August 12, 1945, Japan by Marshal Terauchi in Dalat, Vietnam, told Sukarno, Hatta and Radjiman that the Japanese government will soon grant independence to Indonesia and the proclamation of independence can be implemented within a few days, depending on how PPKI. Nevertheless the Japanese wanted the independence of Indonesia on August 24. Two days later, when Sukarno, Hatta and Radjiman returned to their homeland from Dalat, Sutan Sjahrir urged Sukarno immediately declare independence because it considers the results of the meeting in Dalat as a ruse Japan, because Japan every moment had to be surrendered to the Allies and to avoid a split in the nationalist camp, between anti and pro-Japanese. Syahrir Hatta told about the meeting in Dalat. Soekarno yet convinced that Japan had been surrendered, and the proclamation of independence of Indonesia when it could lead to bloodshed were great, and can have fatal consequences if the fighters Indonesia is not ready. Soekarno Hatta warned that Sjahrir was not entitled to declare independence because it is the right of the Preparatory Committee for Indonesian Independence (PPKI). Meanwhile Syahrir assume PPKI is the body made in Japan and the proclamation of independence by PPKI only a 'gift' from Japan. On August 14, 1945 Japan surrendered to the Allies. Army and Navy of Japan was still in power in Indonesia because Japan has promised to restore power in Indonesia into Allied hands. Sutan Sjahrir, Wikana, Dervish, and Chairul Saleh heard this news through the BBC radio. After hearing rumors of Japan would bend the knees, a young group urged the elderly to immediately proclaim the independence of Indonesia. However, the elderly do not want to rush. They do not want the bloodshed during the proclamation. Consultation was conducted through meeting PPKI. All young people do not approve of the meeting, considering PPKI is a body established by the Japanese. They wanted independence for the efforts of our own nation and not giving Japan. Soekarno and Hatta went to the military authorities of Japan (Gunsei) to obtain confirmation of his office at Koningsplein (Merdeka Square). But the office was empty. Soekarno and Hatta together Soebardjo then to the office Bukanfu, Rear Admiral Maeda, at Jalan Medan Merdeka Utara (Maeda house on Jl Imam Bonjol 1). Maeda welcome them with congratulations on their success in Dalat. As he answered he had not received the confirmation and was still awaiting instructions from Tokyo. Returning from Maeda, Sukarno and Hatta immediately prepare a meeting of the Preparatory Committee for Indonesian Independence (PPKI) on August 16 at 10 am the next day at the office Pejambon Road No 2 to discuss all things related to the preparation of the Declaration of Independence. A day later, the turmoil of pressure that requires the taking of power by Indonesia culminating launched the youth of some golongan.Rapat PPKI on August 16 at 10 am was not held because of Sukarno and Hatta did not appear. The meeting participants did not know the event has occurred Rengasdengklok. The young fighters, including Chairul Saleh, Sukarni, and Wikana - which says a burning surge heroism after discussion with the title Datuk Ibrahim Tan Malaka, who are members of the underground movement lost patience, and at dawn on 16 August 1945. Together Shodancho Singgih , a member of PETA, and another youth, they bring Soekarno (along Fatmawati and Guntur who was only 9 months old) and Hatta, to Rengasdengklok, which became known as Rengasdengklok events. The aim is that Ir. Soekarno and Drs. Moh. Hatta is not affected by the Japanese. Here, they reassure Soekarno that Japan had surrendered and the fighters are ready to fight the Japanese, whatever the risk. In Jakarta, a young group, Wikana, and the elderly, namely Mr. Ahmad Soebardjo negotiations. Mr. Ahmad Soebardjo agreed to proclaim the independence of Indonesia in Jakarta. So diutuslah Yusuf Ahmad Kunto to usher Soebardjo to Rengasdengklok. They picked Ir. Sukarno and Drs.Moh. Hatta returned to Jakarta. Mr. Ahmad Soebardjo managed to convince young people not to rush to proclaim independence. After arriving in Jakarta, they return to their respective homes. Given that the Hotel Des Indes (now a shopping complex in Harmony) can not be used for meetings after 10 pm, then Rear Admiral Maeda bid to use his house (now a museum building proclamation formulation) as meeting places PPKI accepted by Indonesian leaders. In the evening, Sukarno and Hatta returned to Jakarta. Major General Moichiro Yamamoto, Chief of Staff of Army XVI (Army) who became head of the military government (Gunseikan) in the Dutch East Indies would not accept Sukarno-Hatta delivered by Tadashi Maeda and ordered that Major General Otoshi Nishimura, Chief of the General Affairs Department administration militerJepang, to accept the arrival of the troupe. Nishimura argues that since the afternoon of August 16, 1945 has received an order from Tokyo that Japan should maintain the status quo, it can not give permission to prepare the proclamation of independence of Indonesia as has been promised by Marshal Terauchi in Dalat, Vietnam. Soekarno and Hatta regretted that decision and insinuated Nishimura whether the attitude of an officer who was excited Bushido, broken a promise to be pitied by the Allies. Finally Sukarno-Hatta requested that Nishimura PPKI not obstruct the work, perhaps by pretending not to know. Saw a heated debate that Maeda quietly leave the room because Maeda warned by Nishimura in order to obey the orders of Tokyo, and he knows as a Navy liaison officer (Kaigun) in the Army (Rikugun) he does not have the authority to decide. Once out of the house Nishimura, Sukarno-Hatta to the house of Admiral Maeda (now Jalan Imam Bonjol 1) accompanied by Myoshiguna hold a meeting to prepare the text of the Proclamation. After greeting Sukarno-Hatta left arguing with Nishimura, Maeda resigned to her bedroom. Preparation of the text of the Proclamation made by Sukarno, M. Hatta, Achmad Soebardjo and witnessed by Soekarni, B.M. Diah, Sudiro (Grandma) and Sayuti Melik. Myoshiyang half drunk sitting behind a chair listening to the preparation of the text but then there is a sentence of Shigetada Nishijima as if he took interfere preparation of the proclamation and suggested that the transfer of power was only a means of administrative power. Bung Karno about this case confirms that the transfer of power means. Bung Hatta, Subardjo, B. M Diah, Sukarni, Sudiro and Sajuti Malik nothing justifies the claim Nishijima but in some circles claim Nishijima still propounded. Once the draft is complete agreement, Sajuti copying and typing the manuscript using a typewriter taken from the German Navy representative office, belonging to Mayor (Sea) Dr. Hermann Kandeler. At first reading of the proclamation will be made in Ikada Stadium, but since moved kekediaman Soekarno security reasons, Pegangsaan 56 East (sekarangJl. Proclamation no. 1). Negotiations between the young and the elderly groups in the preparation of the text of the Declaration of Independence Indonesia took place at 2 a.m. to 4:00 in the morning. Text written proclamation in the admirals room dining Tadashi Maeda Jln Imam Bonjol No. 1. The authors of the text of the proclamation is Ir. Sukarno, Drs. Moh. Hatta, and Mr. Ahmad Soebarjo. The concept proclamation written by Ir. Sukarno himself. In the front room, was present B.M Diah Sayuti Melik, Sukarni and Soediro. Sukarni proposed that the signed text of the proclamation is Ir. Soekarno and Drs. Moh. Hatta on behalf of the Indonesian nation. Indonesia's Proclamation text typed by Sayuti Melik. The next morning, August 17, 1945, at the residence of Sukarno, Pegangsaan East 56 were present, among others Soewirjo, Wilopo, Gafar Pringgodigdo, Tabarani and Trimurti. We are a nation of Indonesia hereby declare the independence of Indonesia. Matters which about moving kekoeasaan d.l.l., organized by mode of carefully and within the shortest possible. Djakarta, 17 days Boelan 8 tahoen 05 On behalf of the Indonesian nation. Soekarno / Hatta. The event starts at 10:00 pm with the reading of the proclamation of independence by Sukarno's Indonesia and spliced ​​a short speech without notes. Then the flag, which has been sewn by Mrs. Fatmawati, was raised, followed by a speech by Soewirjo, deputy mayor of Jakarta at the time and Moewardi, leaders of Barisan Pioneers. At first Trimurti asked to raise the flag, but he refused on the grounds pengerekan flag should be carried by a soldier. Therefore instituted Hendraningrat Latif, a soldier PETA, assisted by Soehoed for the task. A young woman appeared from behind a tray flag (Sang Saka Merah Putih), sewn by Fatmawati a few days earlier. After waving flag, the audience sing Indonesia Raya. Until now, the inheritance flag is still stored at the Museum National Monument. After the ceremony took place, approximately 100 members of Barisan Pioneers led by S. Brata came in a hurry because they did not know where the sudden change of Ikada to Pegangsaan. They demanded Soekarno repeat the reading of the Proclamation, but it was refused. Finally Hatta provide a brief mandate to them. On August 18, 1945, the Preparatory Committee for Indonesian Independence (PPKI) take decisions, validate and establish the Constitution (Constitution) as the foundation of the Republic of Indonesia, hereinafter known as the Constitution 45. Thus the Government formed the Unitary State of Indonesia in the form of the Republic (NKRI) with sovereignty vested in the people who carried out entirely by the People's Consultative Assembly (MPR), which will be formed later. After that Sukarno and M. Hatta elected at the proposal of Oto Iskandardinata and approval of PPKI as President and Vice President of the Republic of Indonesia first. The President and Vice President will be assisted by a National Committee. 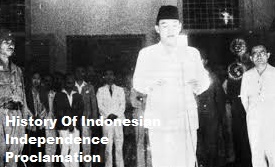 history of Indonesia's independence proclamation August 17, 1945.